What a refreshingly different cruising guide! Yes, just like many others I, too, wondered how it could possibly provide a different point of view on transiting the "ditch" than all the guides before it. Yet, Mark and Diana Doyle have most certainly achieved that goal. In fact, they have provided just the kinds of essential information you need, in a very easy to interpret format, and with a consistent presentation that makes it easy to look up critical information when you need it (like when you've just gone hopelessly aground or the bridge ahead has just unexpectedly closed)! 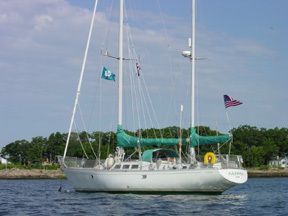 The Doyles' premise is that if one manages the voyage down the ICW, it will be a much more enjoyable experience. So they set out to provide information in a format that satisfies a cruiser's hierarchy of needs, defined as safety, comfort, and appreciation. Rather than instructing cruisers on how to get "there", they provide all the information you need about what you'll find "there" when you arrive. In fact, it's designed to be a workbook that you annotate with your own notes, throw in your bag for shore leave, then bring back aboard enriched with observations that will color your return trip. This is one of the best organized cruising guides we've ever had the pleasure to review. The introduction gives you a quick run down on how to use the book and what to expect along the way. It covers all the basic essentials, such as ATONs (aids to navigation), bridges, locks, rules of the road, sound signals, day shapes, local regulations, security zones, mooring and anchoring, provisioning and marine services. From that point on, the book is organized according to the state you will be transiting, starting with Hampton Roads, Virginia and ending in Biscayne Bay, Florida. 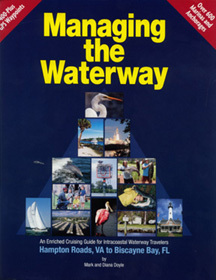 Each section begins with an overview of the upcoming passage and some of the local attractions, then provides a consistent presentation of Safety Info (NOAA Wx, USCG, towing services), Heads Up Info (Bridges, communications channels, security zones, etc), and navigation information, with marinas and anchorages all catalogued by mile marker. How ingenious and utterly useful! All of this information is enhanced with a nice selection of photographs and pleasant narrative to give you a flavor of what you'll be seeing. You'll enjoy reading the anecdotes about local notables like Blackbeard Island and Midnight in the Garden of Good and Evil. But remember to keep an eye out for shallows lest you run aground while engrossed in reading. At the end of each section is a page of "business cards" for the major marine facilities in the area, and complete contact information for each of the facilities and chandleries, again presented by mile marker. And, oh yes, they even provide a conversion chart from statute miles (in which the ICW is measured) and nautical miles so you can easily manage your distance-speed-time calculations.